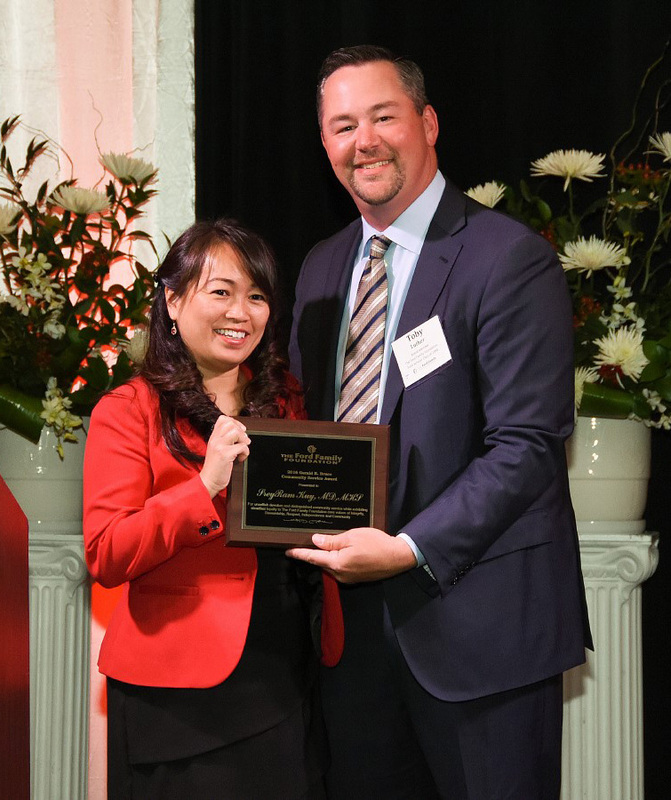 SreyRam Kuy, a Ford Scholar from the Class of 1996, earned the Gerald E. Bruce Community Service Award this year for the initiative she has taken professionally and civically in her Louisiana community. Ford Family Foundation Board Vice Chair and Class of 1994 Ford Scholar Toby Luther presented Kuy with the award at the Ford Scholars Recognition Conference in Eugene on June 25. The Louisiana Secretary of Health recently appointed Kuy to serve as the chief medical officer for Medicaid. Prior to that, she worked at a Veteran Affairs medical center in Louisiana as a general surgeon, where she founded the Center for Innovations in Quality, Outcomes and Patient Safety, which improves the quality of care for veterans. She has also volunteered with various medical organizations. The Foundation is seeking applications and nominations for the annual Gerald E. Bruce Community Service Award for Ford Scholar Alumni who are pillars in their community as entrepreneurs, philanthropists and role models for future generations. Ford Scholar alumni from the Classes of 1994 through 2007 are eligible to be nominated. Nominations may be submitted on behalf of one’s self or by a fellow Ford Scholar and are due Nov. 13, 2016. The selected recipient will receive a plaque and a $5,000 grant to a non-profit organization of his or her choice at the Ford Scholars Recognition Conference in Eugene on July 8, 2017.